So this is how we’ll quieting our hearts this Christmas. This year I will be reading selections from Watch for the Light: Readings for Advent and Christmas. It is a compilation of writings by classic and modern authors from Martin Luther to Annie Dillard. In past years I have joined in with She Reads Truth’s advent plans or read Ann Voskamp’s devotional The Greatest Gift: Unwrapping the Full Love Story of Christmas. You can download your very own beautifully watercolored Jesse tree ornaments for free from The Story Warren. 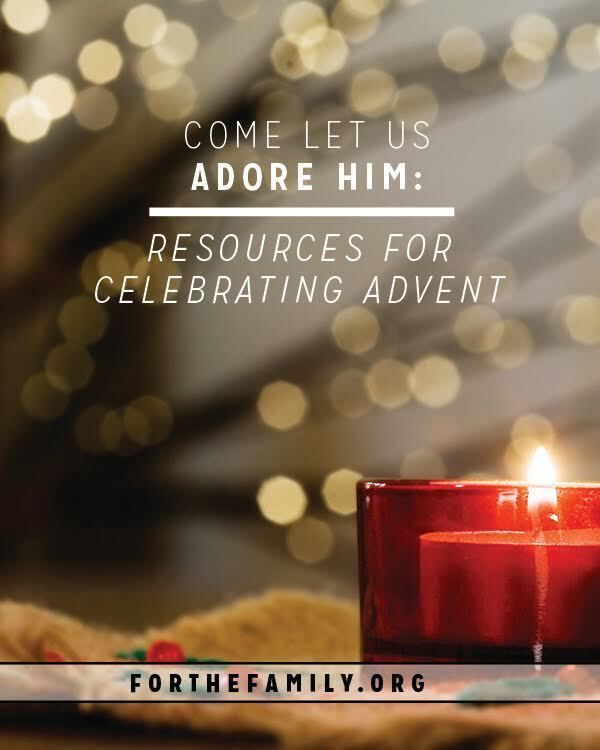 They have created a lovely advent package that contains daily readings from Scripture and to go along with the ornaments they provide (you have to print and assemble). Also, in the morning the kids will follow the Jesus Storybook Advent Reading Plan while eating breakfast. They’ll actually be listening to David Suchet wonderful voice read the passages on CD. Suchet is better known as representing Agatha Christie’s Poirot for Masterpiece Mystery. His dramatic reading of the The Jesus Storybook Bible is captivating. There are so many Advent options it can be hard to pick just one! But it doesn’t have to be complicated. I hope some of these suggestions and resources will enrich the Christmas season for your family. If you already celebrate Advent, would you share your family’s tradition in the comment section? The very first sentence in this piece is “Advent. It means “coming.” It is an invitation to come and adore Christ.” This got me to thinking about a conundrum which I faced even as a child when I was encouraged to adore God. My difficulty was that it seemed to me that at best, all I could ever do was to offer my most compelling and prolific compliments to Him. I would attempt genuine adoration of Him even though I had no real understanding of His actual nature or disposition toward me except for what I had been taught. Further, I could not imagine why God would have need for my accolades anyway since I had been advised and read in scripture that He was pretty sure of Himself, His status, and His abilities anyway without my reminding Him. I now know that the confusion I experienced as a child is as old as Gods’ initial reaching out to us after our fall from His grace. More precisely we know so pitifully little of what it actually means for us as God’s creatures to engage in adoration of Him, especially with regard to our being here on earth. Many years ago, I found myself being quite forcefully compelled in the wake of some rather difficult circumstances in my life to commit myself to one avocation alone as I lived out the duties of my being a husband and father. That commitment was my determination to become sustained without ceasing in personal attendance to God. It was a lot like agreeing to prostrate myself at the throne of the Father without any agenda other than awaiting His pleasure and hoping I could become enabled to do so faithfully for the rest of my life. As you may guess this has been a pretty tall order bordering certainly on the impossible and yet I had come under the conviction that my salvation literally depended upon my deferential decision toward God in this matter. The result of my commitment was a sustained encounter of God in my life the likes of which I had never known before that time. It was the birth of an insatiable hunger within me for personal immersion in the adoration of God. I remember my observation at the time that a adoration of God was not merely some activity in which I had determined to become involved but was the pure and utterly compelling gift of God of Himself, imparted to me without the impediment of my self interest. The gift extended to me was not as a result of my obedience, good behavior, or faithfulness, but simply the result of my determined surrender of myself to Him. I had made myself available to Him and this was His response. I also remember becoming compelled in the conviction that my existence in this state of adoration of God was the fulfillment of my eternal destiny and literally every desire of my heart, with nothing at all lacking. I also understood that although this determination would be the cause of no end of trials and difficulty for me, it was literally my path to Heaven if I should be sustained in choosing it. Now I will not bore you with the finer details of all of that but let it suffice to say that it became quite clear to me, as it remains today that our adoration of God, rather than being a mere activity in which we choose to engage, is actually our knowledgeable participation in the very life which exists between God the Father, His Son our Savior, and the Holy Spirit. It is the incomprehensible gift of our response to genuine recognition the unfathomable God and is our being enabled of a genuine response to Him being our God of which within ourselves we are incapable. He joins us each in adoration of Him for the purpose that we will be joined with Him in a consuming bond of indescribable love, He for us and we for Him. This is a disposition entirely impossible in its attainment for us and yet one enabled without impediment by the birth, life, death, and resurrection of our Savior. We do not adore God in recognition of what He has done for us, For that we revere Him. We adore Him because we may now know with certainty that He is our God and worthy of all adoration and from far better than from the likes of us.